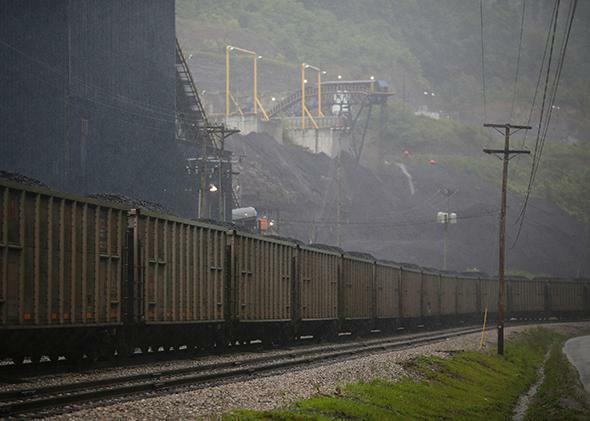 War on coal in the American Midwest: NRG is ramping down its reliance on coal. One of the nation’s biggest power producers is aggressively ramping down its reliance on coal. A loaded CSX Transportation coal train sits parked on a spur track at Blackhawk Mining’s Spurlock Prep Plant on June 3, 2014, in Printer, Kentucky. Coal continues to provide about a third of America’s electricity, but will decline in importance in the coming years. When coal industry veterans in states such as West Virginia and Kentucky invoke a “war on coal,” they’re talking about a conspiracy—a cabal of federal bureaucrats who don’t like the industry (or modernity, or energy) trying to drive a job creator and economic-growth engine out of business. But the reality is much different. A host of economic, political, and environmental concerns are pushing organizations—many of them profit-seeking businesses—to try to use less coal or stop using it altogether. The big increase in the production of natural gas, the sharp rise in renewables, state efforts to improve air quality, and stricter standards promulgated by the federal government are pushing utilities to act: either to install expensive new controls on coal plants or shut them down. Coal isn’t being banned or outlawed. But the rapidly changing environment is pushing businesses to reconsider its use. We reported earlier this month on the Canadian province of Ontario, which is coming to the end of an 11-year campaign to rid its electricity generation system of coal. But a more significant campaign is being waged in the U.S., where coal still accounts for about 35 percent of electricity generation, by one of the industry’s leading players: NRG. Through aggressive acquisitions, NRG has grown into one of the largest power producers in the country. Its plants—spread around the country and using all available fuels—serve about 40 million homes. So the notion of NRG kicking coal, the bread and butter for many of its largest operations, is something like McDonald’s reducing the use of salt and potatoes. NRG is led by David Crane, who has a degree in public policy from Princeton and a law degree from Harvard, and who believes in climate change. Based in New Jersey and Texas, NRG presides over a huge generating fleet with about 52 gigawatts of capacity; coal has accounted for about one-third of its generation. Until now. Over the past year, and especially this summer, NRG has announced steps that will result in a reduction of its coal purchases by at least 25 percent. At first glance, it seems like NRG has it in for coal. Having recently acquired a bunch of coal plants in the industrial Midwest, NRG is now moving to shut some down and swap natural gas for coal at others. Earlier this year, NRG closed on the purchase of Edison Mission Energy, which owned several coal-fired plants. Many of those plants were already compelled by the state of Illinois to reduce emissions sharply; this month NRG announced a series of additional moves. The Joliet plant, with a capacity of 1,326 megawatts, will be converted to run on natural gas. A 251-megawatt unit at the Will County plant will close by next April. Two remaining plants, the 1,538-megawatt Powerton plant (near Peoria) and the 689-megawatt Waukegan plant (north of Chicago) will continue to burn coal, but with new emissions controls. At a cost of $545 million, NRG says, these plants will emit 60 percent less carbon dioxide in 2020 than they did in 2013, while cutting sulfur dioxide and nitrogen oxide emissions by 90 and 65 percent, respectively. Combined, they will take 1,578 megawatts of coal-fired capacity out of service. Elsewhere, NRG is further reducing its reliance on coal. Earlier this month an NRG subsidiary completed the acquisition of the Alta Wind farm in California, which at 947 megawatts is the largest such installation in the country. Meanwhile, in the heart of coal country—which is now one of the hearts of natural gas country, too—NRG is aggressively transitioning coal-burning plants to run on cleaner-burning fuels. Again, the company is making these moves less in response to federal standards and more in response to market forces (the availability of cheap, stranded natural gas in Pennsylvania and Ohio) and state actions mandating cleaner air. But the effect is the same. As part of its acquisition of GenOn Energy in December 2012, NRG acquired a bunch of old, coal-burning plants in Ohio, Pennsylvania, and New York. Over the past several months, it has announced aggressive plans to remove coal from the mix. Four huge power plants will be converted to run on natural gas. A fifth plant in Portland, Pennsylvania, will run on ultra-low-sulfur diesel. * As these efforts are completed over the next two years, they will remove a combined 2.45 gigawatts of coal capacity from NRG’s business. Before it acquired the Alta Wind farm, NRG had about 52 gigawatts of energy production in the U.S., of which about 16.8 gigawatts, or about one-third, relied on coal. These moves in Illinois and in Ohio, Pennsylvania, and New York alone will remove more than four gigawatts of coal capacity from the mix, or nearly 25 percent of the total. Eventually, coal could account for less than one-quarter of NRG’s generating capacity. “We’re going to clean up, diversify this fleet, and move it into the 21st century,” said Lee Davis, an executive vice president and regional president at NRG. For many critics, this isn’t nearly enough. In response to NRG’s moves in Illinois, the Sierra Club complained that NRG would still be burning coal at the Waukegan plant, which is near large population centers. Still, NRG will be burning significantly less coal tomorrow than it does today, and much of that coal will be burning more cleanly. Those who are concerned about emissions, climate change, and air quality should regard this as a major sign of progress. And it shows that in the absence of the blunt, presently unattainable instruments of a cap-and-trade regime, carbon tax, or ban on coal, the unregulated for-profit energy industry can significantly reduce its emissions of CO2 and other greenhouse gases. In this phase of the war on coal, some of the biggest combatants are its biggest customers.